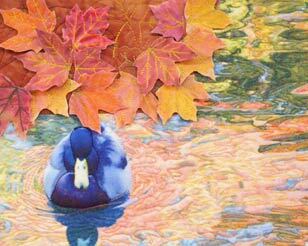 27.5" w. x 21" h.
The autumn colors reflected in the water of a pond in Westerly, Rhode Island attracted a flock of Mallard ducks and me. 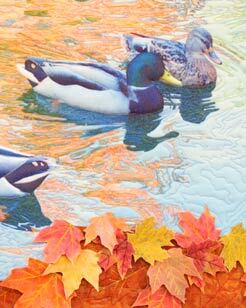 Disperse dyed polyester and cotton fabrics by the artist. The ducks are in high relief with trapunto. 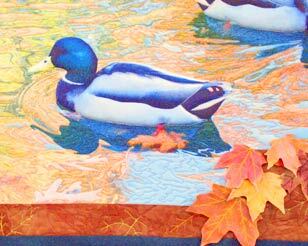 Three dimensional leaves embellish the border as though the viewer is peeking through the leaves. Machine pieced and heavily quilted/embroidered. 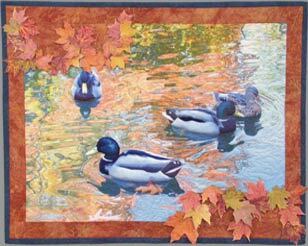 Won Best in Show at Aullwood Audubon Art Quilt Show, 2003.